Nylon Harness for Walking, Training and Working with German Shepherd in Any Weather! German Shepherd is the most universal breed, which combines all the positive qualities of working dog, has a high order of intelligence and excellent learning ability. German Shepherd puppies adore to train from the early puppyhood and catch new information in a wink. It's rather easy to train German Shepherd for various purposes due to its natural instincts, but you won't go without special dog training equipment and the dog harness is one of mast-have dog gear for successful GSD training. This working dog harness is an ideal variant for walking, training, sports, police, K9, service work and many other German Shepherd activities. 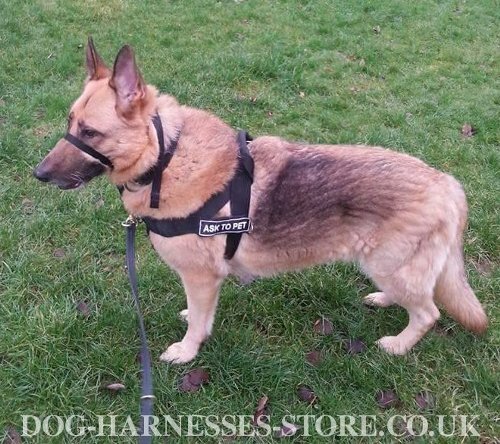 Our German Shepherd harness is extremely durable, light-weighted, super comfortable and functional item for your dog. It's made of nylon, which is very reliable, water-resistant and easy to clean material. 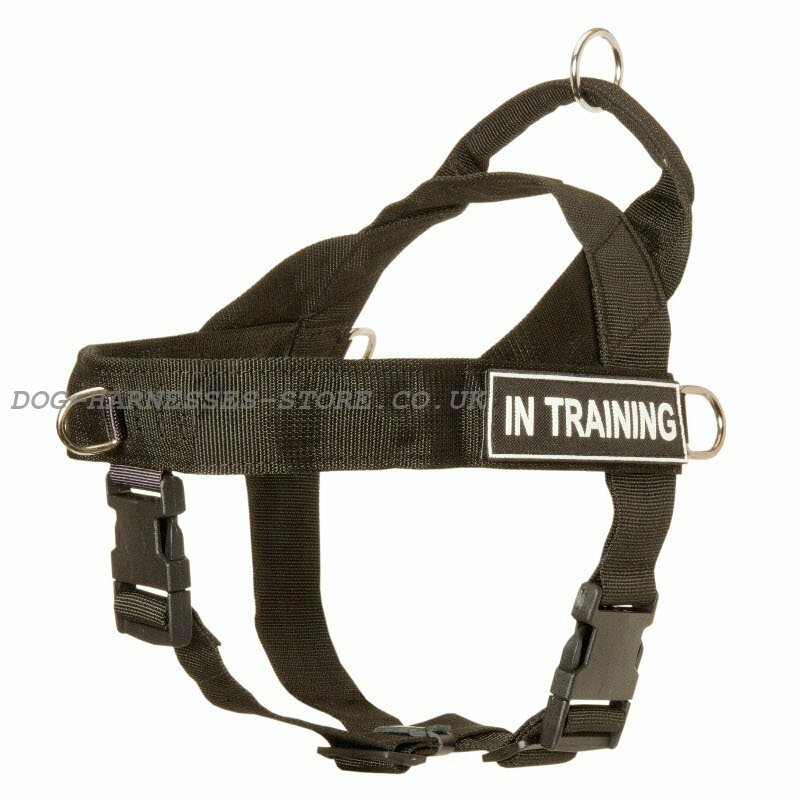 The design of this nylon dog harness makes it super functional. 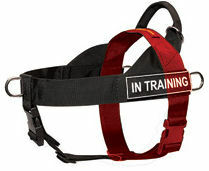 Side rings for pulling, upper ring for leash walking, ring on the chest strap to stop dog pulling, quick-release plastic buckle and removable ID patches on Velcro. One set of patches is included in the order for FREE. Top quality harness for your German Shepherd! 1. 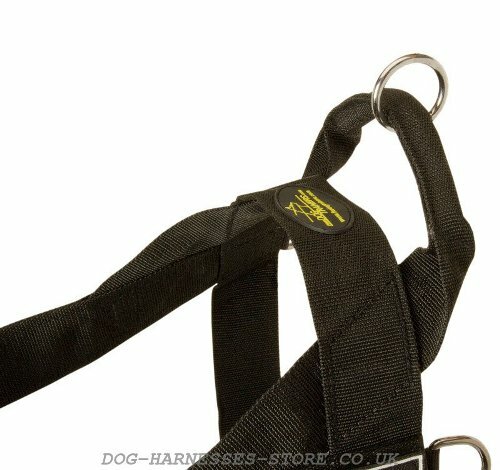 Hello, I have received the order and send you the photo of my younger dog with your harness. 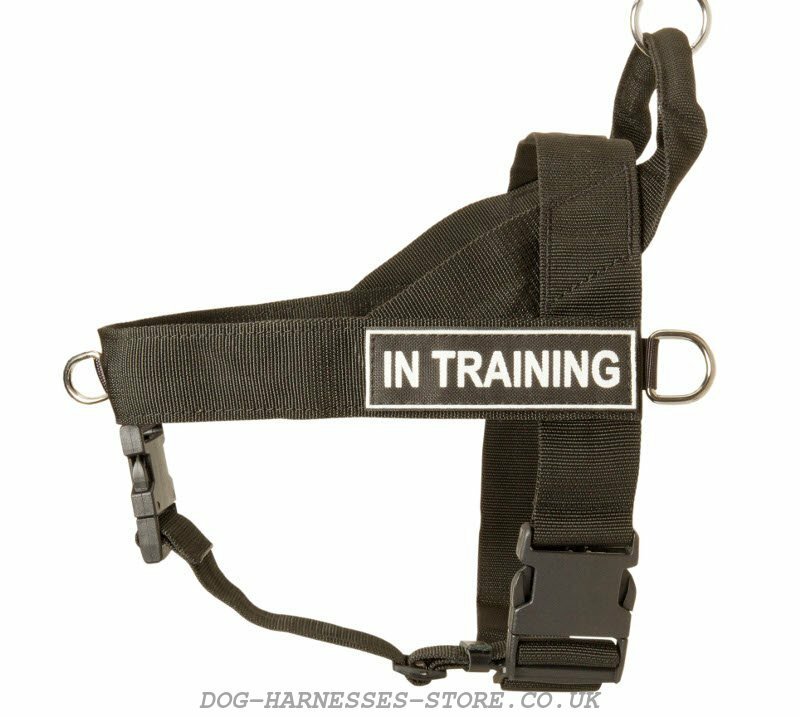 I've already have this harness for my elder dog!!! The products are very good!!! Thank you. 2. The harness was shipped without any problems. Ted is worring, hanging around now, but the harness stays put as you've seen my dog on the video. 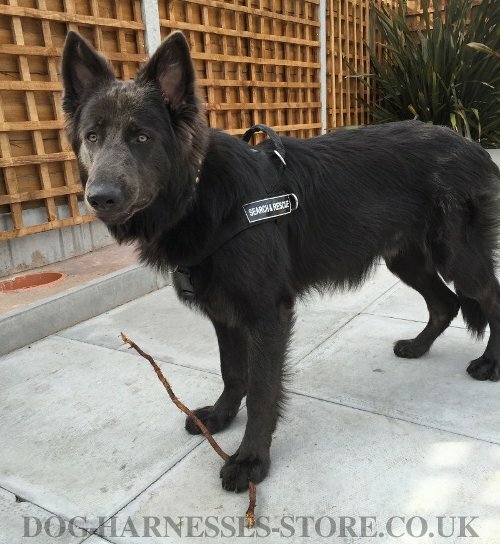 Ted is a very energetic boy and your harness has made global changes to his behaviour on the leash. I have a progressive lung disease and I understood that his pull was uncontrolled, but now he is fully-controllable with the help of your harness and it's joyfully to walk with him. 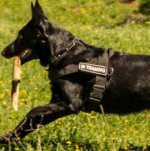 See our unique collection of dog harnesses and collars for German Shepherd. 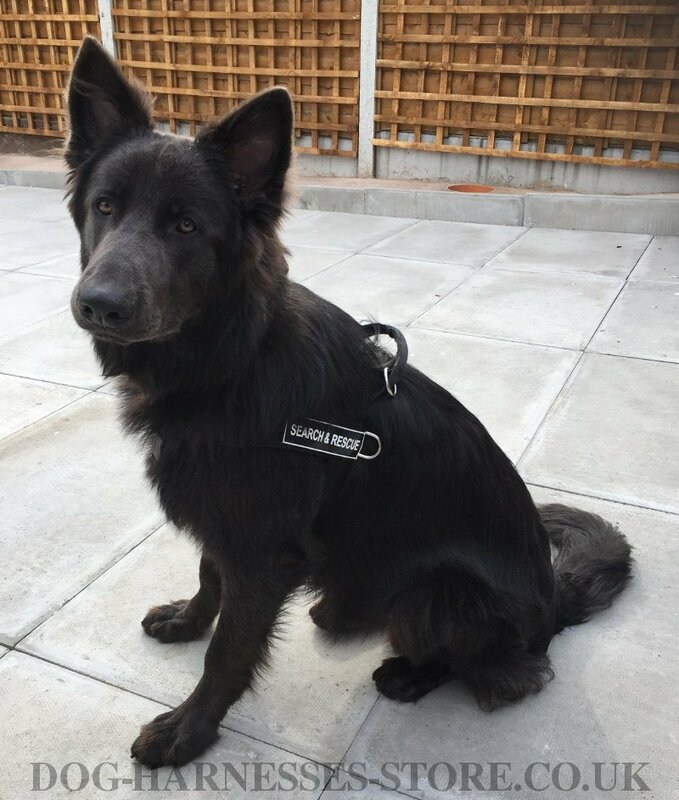 We got the harness for our 8 months old GSD. 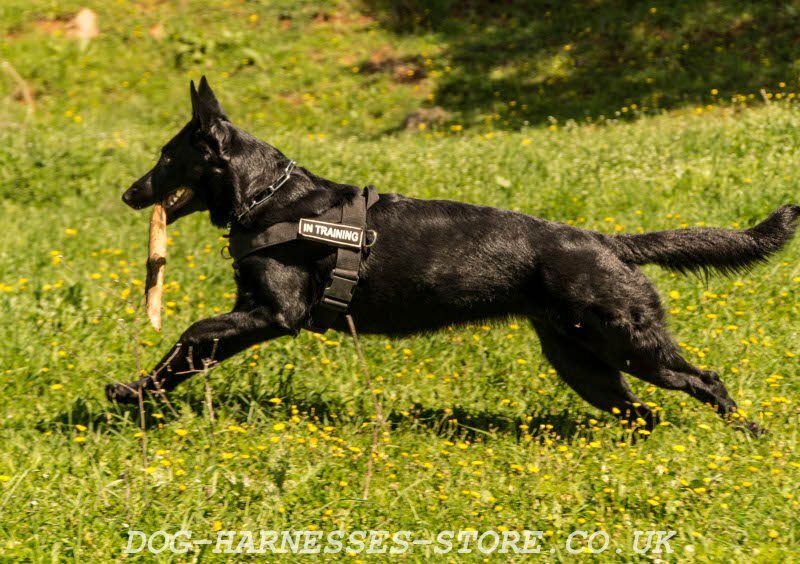 The harness is fantastic, our walks became better. Super quality and perfect fit. Excellent service. I'm very happy to have this harness. We'll continue buying products for our dog from Fordogtrainers. I received the product today in the morning. It fits perfectly. Thank you a lot! Hello! Thank you for the harness. I would like to leave a small feedback. 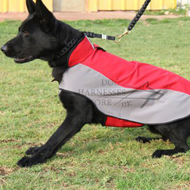 The design of the product is very good, my German Shepherd was cured out of pulling on the leash. The harness is also very comfy for my dog.